One Time Around is the story of my long solo road trip last summer on my V-Strom 650, 14,000 miles wandering around the country when I should have been doing something constructive. It's a fun read, I've had a number of compliments on it and there's actually four reviews of the book on Amazon, and not a one of them from a blood relative! I left on the trip in mid-July of 2010, and didn't come home for 67 days. I rode through 37 states and kept a daily journal. This book is what came out of cleaning up and fleshing out the entries in the journal. 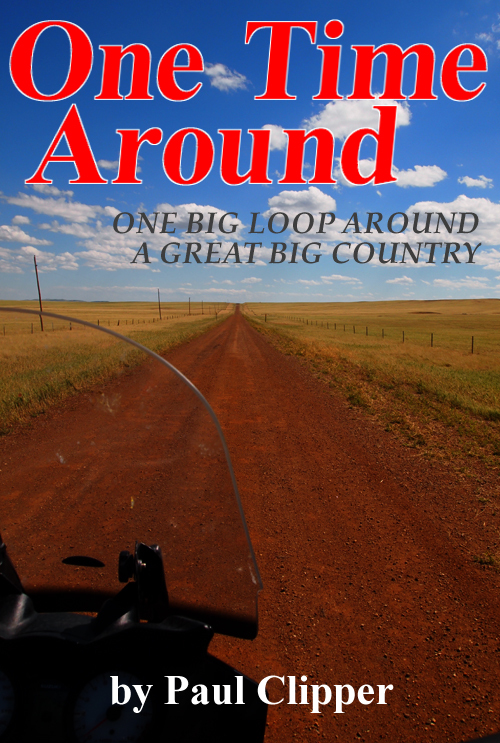 It's not your usual examination of miles per day and fuel economy, rather it's like a rambling travelogue and examination of what back roads America looks like. It was a great trip, and I think that comes out in the story. 36 color photos. The Art of Trailriding is all the monthly Trail Rider columns of the same name gathered together into an e-book. I had a lot of requests for this in paper form, but the e-book route is easy and cheap, and fast. In The Art of Trailriding you will find 33 chapters of how-to-ride lessons, each focused on a specific problem or obstacle that may come up in a normal day's trailride, and an explanation of how to attack that obstacle and just turn it onto another fun riding opportunity. This was our most popular column in Trail Rider, and having it all gathered together in one place is pretty neat. 35 photos, black and white on the Kindle, color on the iPads/iPhones/smartphones/computers. The Best of Last Over, Volume 2 and 3 are compilations of monthly Last Over columns from the years 1987 through 1989 in Volume 2, and 1990 through 1992 in Volume 3. There are 24 stories or so in each collection, some contemplative, some humorous, some informative and all of them entertaining. It takes a fair amount of work to dig all these old stories out, clean them up and format them for the Kindle platform, but it's fun to go back and re-read the ravings of a much younger me. So at least I'm enjoying it, right? I have about 288 Last Over columns to weed through in this secondary publishing deal, so get comfortable with it. If you enjoy Last Over, I've got at least four more volumes coming! Each book features one color photo of a very young me. Every one of the books above are available now, and easily adaptable to your chosen type of electronic apparatus through Amazon's e-reader apps. Yep, you can load them into your iPhone, iPod Touch, iPad, Android device, laptop, desktop computer and who knows what else. Honestly, the iPad app is the best, since it renders the photos in color and the iPad is somewhat portable, and it’s a big screen. I saw a lot of tourists taking pictures this summer with an iPad! Any of the apps that work with a laptop or desktop computer, or a color-screened smartphone work well and make the pictures look pretty. But, the Kindle works great too, you just get a black and white photo with it--unless you have the new Kindle Fire. Thank you for your support, and I hope you enjoy them!